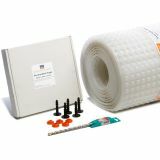 PermaSEAL 8 Clear Kit is designed for floor and wall application. PermaSEAL 8 Clear is suitable for use in accordance with BS8102:2009 to provideType 'C' drained protection to structures below ground providing a Grade 3 dry environment suitable for domestic or commercial use. PermaSEAL 8 Clear has a life expectancy of at least 50 years (DIN 9001:2000). PermaSEAL 8 Clear is an inert product with high compressive loading stability. It is highly resistant to water, alkalis, saline solutions and organic acids, and is not affected by minerals. It is also resistant to bacteria, fungi, and other small organisms. Our innovative PermaSEAL Brick Plug Super in combination with the seal is used when fitting the PermaSEAL 8 Clear to the wall and if a below ground waterproofing system is being installed then it should be used with our Drainage Channel, Floordrain and sump and pump drainage systems. PermaSEAL 8 Clear Waterproofing Membrane can accept a range of wall and floor finishes. PermaSEAL Brick Plug Super accept screws which allow for the addition of batons and metal lath systems which can be insulated before the addition of plasterboard finish. Fixtures, fittings walls and staircases can be built off PermaSEAL 8 Clear membrane. When used as a floor membrane insulation, underfloor heating, screed and floating floors can all be accommodated. Really pleased with this kit. Has the correct amount of fixing plugs which is more than can be said for the last company i used. Good service all round thanks. Good deal, does the job.